The Hamilton Beach 12-Cup Digital Coffeemaker has an easy-access design for fast and easy filling so you can enjoy the perfect cup of coffee in the morning. 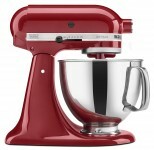 Beautiful and hard-working, this stand mixer's strong 325-watt motor delivers the power to handle the heaviest mixtures, and mix large batches easily. With our time on Earth coming to an end, a team of explorers undertakes the most important mission in human history; traveling beyond this galaxy to discover whether mankind has a future among the stars. Copyright © 2019 Creativeherb Cool Stuff - .